Michael Halminski began photographing the beaches, waters, and forests of the Atlantic maritime environment in 1973 when he moved to Hatteras Island, North Carolina. His work is marked by his skill as an artist and by his intimate knowledge of the people, animals, and landscapes of the string of barrier islands known as the Outer Banks. Although most of his work has been shot on Hatteras Island, Mike’s portfolio also includes images from his travels to coasts and rainforests of Costa Rica. For two winters he worked as an oysterman on a sailing skipjack in the Chesapeake Bay, where he compiled a pictorial record of this vanishing industry. His work has appeared in numerous publications in over 40 countries, including Newsweek, The Washington Post, Christian Science Monitor, Southern Living, Coastwatch, VSD Magazine Paris and Harcourt Publishing in Australia. For five years, he was a regular columnist for Mariners Weather Log, published by the U.S. Department of Commerce, National Oceanic and Atmospheric Administration. Mike has also worked as an assistant to National Geographic and Magnum photographer David Alan Harvey on various assignments. His work has been used by The Nature Conservancy, North Carolina Coastal Federation, National Park Service and U.S. Fish and Wildlife Service. From 1983 up until 2000, he was instrumental in saving the historic Chicamacomico Lifesaving Station, a complex of buildings on Hatteras Island that date back to 1874. Mike is proud to have served on the North Carolina Aquarium at Roanoke Island Advisory Committee for 23 years and 8 years as chairman. 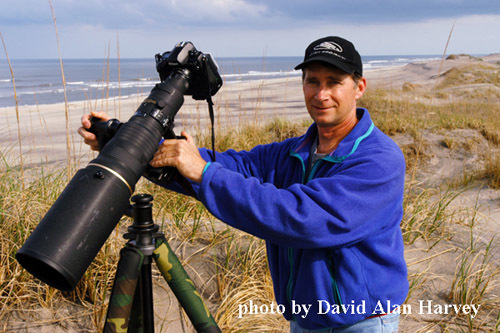 He is represented by SuperStock, Inc., a Jacksonville, Florida based stock agency, and has been a resident of Hatteras Island for over 40 years, where he manages his photography gallery, archives and makes his prints. Hello Michael, I just finished reading Chris White’s book “Skipjack” and thought of you and your time at Tilghman’s Island. I have the photo of the Widner leading in the fleet through the ice right above my desk. After reading the book, I couldn’t help but think Wade’s head must be the size of the Goodyear Blimp. I haven’t seen him yet but will certainly kid him about it when I do. I haven’t been down to Hatteras since our last visit; which has been several years now, certainly need to. I love you website and will cruise it some more when I can. Take care, Keith Lockwood, Oxford, Maryland. Long time no see. I like what little I see here. Man you take some great pics. Anyway I was just looking for you and will be sending an email about the class reunion. I’ll come back and look at more pics another time. hi mike, are you still Living in Rodanthe? It’s been a while since the cottage project in 76. Glad to see your dream came true in your photography career, it sure beats pounding nails. Hi Mr Halminski, I googled Gull Island just to see what was there and saw your beautiful photos. My father was Alex Kotarides and I remember how he spoke highly of you and your talent. I used to go to Gull Island as a child every year on an after Christmas hunting trip, starting when I was eight years old and into my teens. To my father’s sorrow, I was not a hunter. I loved to observe and study wildlife, and I enjoyed the comradery of the hunters. I did enjoy fishing however when we would go in the summer. It’s great to hear from you. You may have been on the island once, when I was helping out there. Your dad was a good man to work for and always treated me with respect. He even payed me an advance to buy a new telephoto lens to shoot wildlife. Gull Island was and still is a sanctuary. The NC Wildlife Resources Commission eventually bought the island and it’s protected now. As you probably know, it’s a huge nesting place for thousands of beach birds. I was there with state biologists about 5 years ago doing a count. Every visit amazes me. Please stop in if you ever travel to my neck of the woods. It has been a pleasure talking with you. I appreciate your letting me try your lens. When you have a moment, I would like the link and reminder of the lens info.